Contemporary human mtDNA haplogroup distribution, based on analysis of 2,054 individuals from 26 populations. (a) Pie charts on the map. (b) Counts of haplogroups in table format. For populations details, see 1000 Genomes Project#Human genome samples. In human genetics, a human mitochondrial DNA haplogroup is a haplogroup defined by differences in human mitochondrial DNA. Haplogroups are used to represent the major branch points on the mitochondrial phylogenetic tree. Understanding the evolutionary path of the female lineage has helped population geneticists trace the matrilineal inheritance of modern humans back to human origins in Africa and the subsequent spread around the globe. The letter names of the haplogroups (not just mitochondrial DNA haplogroups) run from A to Z. As haplogroups were named in the order of their discovery, the alphabetical ordering does not have any meaning in terms of actual genetic relationships. The hypothetical woman at the root of all these groups (meaning just the mitochondrial DNA haplogroups) is the matrilineal most recent common ancestor (MRCA) for all currently living humans. She is commonly called Mitochondrial Eve. The rate at which mitochondrial DNA mutates is known as the mitochondrial molecular clock. It's an area of ongoing research with one study reporting one mutation per 8000 years. mtDNA haplogroup tree and distribution map. The numbers are haplogroup labels, reported according to the http://www.phylotree.org/ nomenclature, and give the location of one of the mutations leading to the derived haplotype. (Only a single branch defining marker, preferably from the coding region, is shown.) The main geographic features of haplogroup distribution are highlighted with colour. This phylogenetic tree is based on the Van Oven 2009 tree and subsequent published research. Estimated world map of human migrations based on mtDNA haplogroups. While Bryan Sykes claimed there were seven "daughters" – or major mitochondrial lineages – among modern Europeans (H, J, K, T, V, X and U - essentially subclade U5), other scientists put the number at 10–12 - for instance, Richards et al include I, W and N1b within their pan-european survey (but - illustrating how complex the question can be - also separate out pre-V, HV1 and pre-HV1, and separate out U to include U1, U2, U3, U4 and U7 as well as U5). The additional "daughters" are generally said to include haplogroups I, M and W. A 2012 paper suggested that the haplogroups most common in modern European populations were: H, J, K, N1, T, U4, U5, V, X and W.
Since a single mutation may define a haplogroup, the total number of "European mtDNA haplogroups" – even if they are defined only as those mentioned above and their descendant clades – is ultimately subjective, could theoretically number in the millions, and be continually increasing. M sub groups that are currently identified as specific to Australia are M42a, M42c, M14 and M15. Also Q1, Q1b, Q3a1 in northern Australia (Q is a major sub division of M also found in New Guinea. N sub-groups are S, O (Australia). R (itself derived from N) : P N: S & O. S: Haplogroup S has a wide distribution in Australia and has several major subclades, S1, S1a, S1b, S1b1, S1b2, S1b3, S2, S2a, S2b, S3, S4. The ancient matriline, called S1a has been characterised by complete and partial mt genomes in New South Wales, central, western, south Australia, Northern Territory (Refs)and in Tasmania by partial sequences (ref 8) O haplogroup: O1, O2 identified by complete mt genome have been identified in southern, northern and western Australia. P4b (now called P11), further diversified by into several distinct but culturally connected family lineages (van Holst Pellekaan 2011) and 2013.
van Holst Pellekaan, S.M., Ingman, M., Roberts-Thomson, J., & Harding, R. M. 2006. 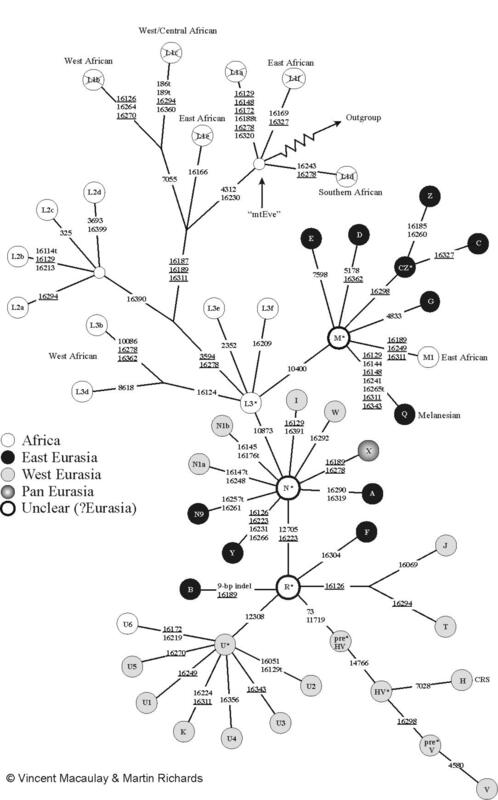 Mitochondrial genomics identifies major haplogroups in Aboriginal Australians. American J Physical Anthropology. 131:282-294.
van Holst Pellekaan, S., 2011. Genetic evidence for the colonization of Australia, Quaternary International.doi:10.1016/j.quaint.2011.04.014. Rasmussen, M., Guo, X., Wang, Y., Lohmueller, K. E., Rasmussen, S., Albrechtsen, A., Skotte, L., Lindgreen, S., Metspalu, M., Jombart, T., Kivisild, T., Zhai, W., Eriksson, A., Manica, A., Orlando, L., De La Vega, F. M., Tridico, S., Metspalu, E., Nielsen, K., Avila-Arcos, M. C., Moreno-Mayar, J. V., Muller, C., Dortch, J., Gilbert, M. T., Lund, O., Wesolowska, A., Karmin, M., Weinert, L. A., Wang, B., Li, J., Tai, S., Xiao, F., Hanihara, T., Van Driem, G., Jha, A. R., Ricaut, F. X., De Knijff, P., Migliano, A. B., Gallego Romero, I., Kristiansen, K., Lambert, D. M., Brunak, S., Forster, P., Brinkmann, B., Nehlich, O., Bunce, M., Richards, M., Gupta, R., Bustamante, C. D., Krogh, A., Foley, R. A., Lahr, M. M., Balloux, F., Sicheritz-Ponten, T., Villems, R., Nielsen, R., Wang, J. & Willerslev, E. 2011. An Aboriginal Australian genome reveals separate human dispersals into Asia. Science, 334, 94-8. Gomes, S. M., Bodner, M., Souto, L., Zimmermann, B., Huber, G., Strobl, C., Röck, A. W., Achilli, A., Olivieri, A., Torroni, A., Côrte-Real, F. & Parson, W. 2015. Human settlement history between Sunda and Sahul: a focus on East Timor (Timor-Leste) and the Pleistocenic mtDNA diversity. BMC Genomics, 16. Ref: Presser JC, Deverell AJ, Redd A, and Stoneking M. 2002.Tasmanian Aborigines and DNA. Papers and Proceedings of the Royal Society of Tasmania, 136:35-38). Hudjashov, G., Kivisild, T., Underhill, P. A., Endicott, P., Sanchez, J. J., Lin, A. A., Shen, P., Oefner, P., Renfrew, C., Villems, R. & Forster, P. 2007. Revealing the prehistoric settlement of Australia by Y chromosome and mtDNA analysis. Proc Natl Acad Sci U S A, 104, 8726-30. ^ Rishishwar L, Jordan IK (2017). "Implications of human evolution and admixture for mitochondrial replacement therapy". BMC Genomics. 18 (1): 140. doi:10.1186/s12864-017-3539-3. PMC 5299762. PMID 28178941. ^ Kivisild T (2015). "Maternal ancestry and population history from whole mitochondrial genomes". Investig Genet. 6: 3. doi:10.1186/s13323-015-0022-2. PMC 4367903. PMID 25798216. ^ a b van Oven M, Kayser M (February 2009). "Updated comprehensive phylogenetic tree of global human mitochondrial DNA variation". Human Mutation. 30 (2): E386–94. doi:10.1002/humu.20921. PMID 18853457. ^ Richards, Martin; Macaulay, Vincent; Torroni, Antonio; Bandelt, Hans-Jürgen (November 2002). "In Search of Geographical Patterns in European Mitochondrial DNA". The American Journal of Human Genetics. 71 (5): 1168–1174. doi:10.1086/342930. PMC 385092. PMID 12355353. ^ "Disuniting Uniformity: A Pied Cladistic Canvas of mtDNA haplogroup H in Eurasia"
Wikimedia Commons has media related to Human mtDNA haplogroups.